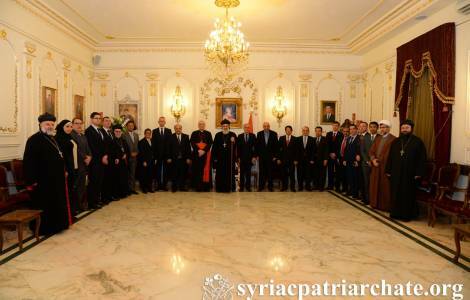 Damascus (Agenzia Fides) - Ambassadors and heads of diplomatic missions from various Countries took part in the official reception offered in their honor by Mor Ignatius Aphrem II, Patriarch of Antioch of the Orthodox Syrians, at the patriarchal seat located in the damascene district of Bab Tuma . Also Cardinal Mario Zenari, Apostolic Nuncio in Damascus, and Dr. Ayman Sousan, Minister of Foreign Affairs of Syria were present. In his greetings- according to official sources of the Syrian Orthodox Patriarchate - Patriarch Aphrem II listed the turning points registered in the general condition of Syria, starting from the progressive retreat of the jihadist militias, recalling the suffering of all the Syrian people in the last years of conflict, and underlining that now the reconstruction of Syria devastated by war calls into question all the Syrians, the international community and even the Churches, called to encourage the spiritual healing of the entire population. After Patriarch Cardinal Mario Zenari also intervened, emphasizing the presence of diplomatic representatives and the recent re-opening of many embassies in Damascus as a positive sign for the recovery of the country. This process was also underlined with satisfaction by Syrian Foreign Minister Ayman Sousan . In recent weeks, the significant re-opening of the Embassy of the United Arab Emirates (country just visited by Pope Francis, and traditional ally of Saudi Arabia, the regional power considered hostile to the Syrian government of Bashar al Assad, supported instead by Iran).